Children are naturally inquisitive. When they reach the toddler years they begin to ask the question â€œwhyâ€? With four children I have answered thousands of their why questions. Child, â€œwhy, why, why, why, etc.
. . . because I said so, now get in the bathtub! Oftentimes it is aggravating when my children ask why, because I suspect that they are using it as a stall tactic to keep from doing what I asked them to do. But, I suppose that many times there is genuine curiosity and desire to learn why the sky is blue, or why dogs have four legs, or why there arenâ€™t any more dinosaurs, or why that man is homeless, or why we need to wear pants, etc. People ask the question of why for various reasons. Some are truly seeking answers to things that they do not understand. They want to help their organization grow and they as individuals want to grow. Some simply say it as a way of expressing their opinions as being right. They are not seeking truth only seeking to prove their opinions to be correct. While an explanation being given they, instead of listening, are forming their next â€œwhyâ€ question in their mind. Some use the power of why to stir up trouble. They are not seeking solutions but seeking only to watch as their organization goes into a brawl. These are instigators and troublemakers. They really donâ€™t care that an answer is reached, instead they are more interested in the chaotic process. 1) Asking why helps to separate tradition and history from doctrinal truth and vision. The two are not always self-contradictory, but many times can be. The leader has the charge of leading the organization into truth and the future while not allowing nostalgia and tradition to derail the vision. 2) Asking why can be a time of growth. Any organization that does not allow itsâ€™ members to ask the question is setting itself up for decline. The decline can be found in a member who is truly seeking honest answers as to why things are done a specific way and they are denied an opportunity of growth. The organization, if it allows others to ask why, opens itself up to evaluation. Organizations operate the way they do for a reason, good or bad. 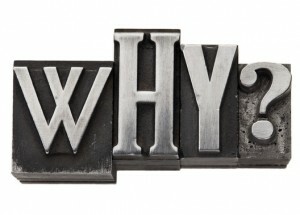 Asking why helps to confirm the rationale for itsâ€™ methods or exposes their weaknesses. 3) Asking why exposes the leaderâ€™s heart. There are many leaders who see those on their team as means to ends. They are not concerned about their personal growth; instead they are seen as a way to advance their agenda. If they ask why, it is seen as rebellion to the leader â€“ these type of leaders want hear, â€œyesâ€ not â€œwhy.â€ Any leader who sees itâ€™s staff as disposable will leave destruction in their wake. A good leader has a vision and plan and grows his people as he grows his organization. Loyalty and trust is earned by expressed concern and love. Staff need to know they are cared for and that their own growth as a person is important to the main leader. Everyone on the team needs to understand why we are doing this â€“ even if the answer is obvious or simplistic. 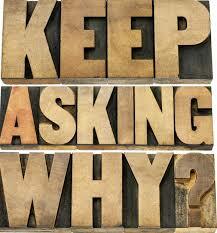 4) Asking why may lead to an answer. Are you really ready for the answer? Before you ask why, you need to consider are you willing to change if the answer comes back as something you didnâ€™t expect. Asking why is an indication of your desire to understand and grow â€“ but donâ€™t ask the question is you really donâ€™t want to know the answer. Otherwise you are just stirring up trouble. 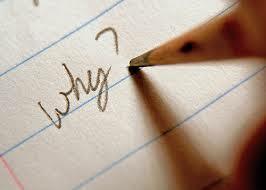 5) Asking why is powerful and evokes a powerful response. When you ask it, you should seek to confirm in others on the team that you are genuine in your desire to help improve the organization. Also, know that there may be strong emotional responses and be prepared to just step back or let things go until another day. Asking why speaks to m otive, the heart, or past situations that were â€œsticky.â€ So solutions or answers were reached and things were decided that worked for the day. Sometimes itâ€™s better not to drudge all that up again. When you ask why, be ready for a strong answer. If an answer is not known, then plan to be apart of finding the answer. If you are going to point out something that is wrong, then plan to be apart of the solution if you are able. But donâ€™t stop asking why. But prayerfully find the right time and check your heart to make sure you are asking for the right reasons.